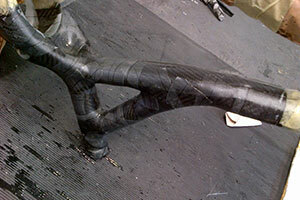 We can fix almost any Carbon Fibre bike, from minor cracks and blemishes to frame and wheel repairs. 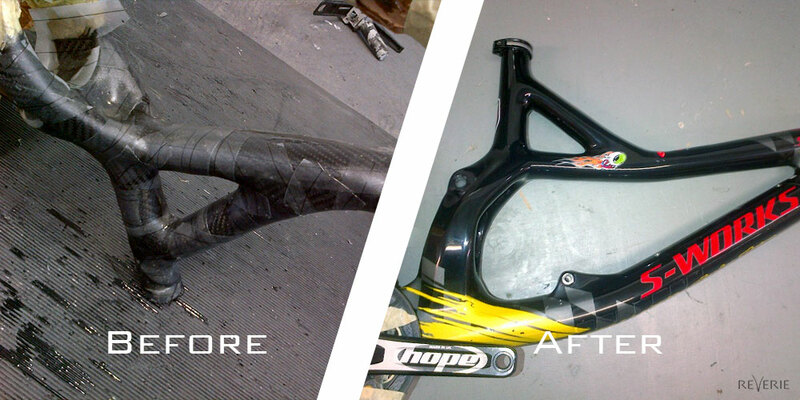 We pride ourselves on taking bikes back to pristine condition, ensuring your satisfaction and peace of mind. 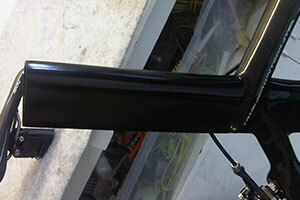 All repairs are made on our premises in Colchester, Essex using the latest equipment and techniques, by highly trained staff who have been successfully repairing bikes (and other products) for many years. 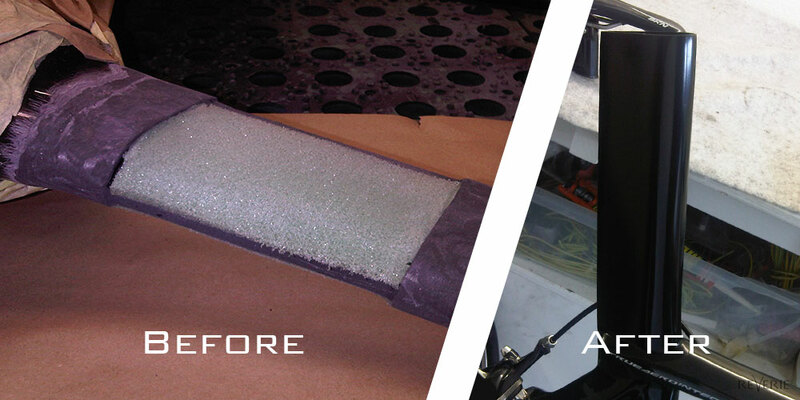 We are a highly experienced composite design, manufacture and repair company, designing and producing hundreds of our own products, but we willingly take on small repair jobs as well as complex ones. Contact us today to discuss your requirements, or alternatively, bring your bike along to our premises to discuss with us your repair requirements in person. 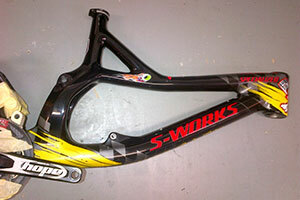 Can you repair Carbon Fibre bike frames? Yes, most cosmetic damage can be repaired and usually most frame damage can be repaired, (we have completed numerous repairs of bicycles in the past). We would, however, need to look at the bike first to judge the extent of the damage, how to repair (if possible) and the likely cost. Can I send my bike to you? In almost all cases yes, however it depends on the nature and extent of the damage, for instance, if damage is extensive or in a difficult location, then it may not be possible to achieve a totally invisible repair. This is something that we would discuss with you when quoting. 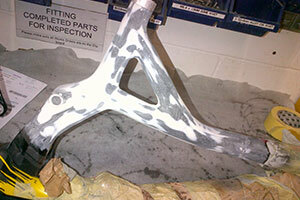 Can you paint repaired parts? Yes, we offer a full painting surface, including properly preparing the part by wet flat sanding or vapour blasting and then painting and polishing, colour or clear coated, to exacting standards. We have state-of-the-art painting and polishing equipment and highly trained staff to provide only the very best finish. This entirely depends on the extent of the damage and work required and our current work load, but we aim to turn around repairs as quickly as possible. Please contact us to discuss your requirements. 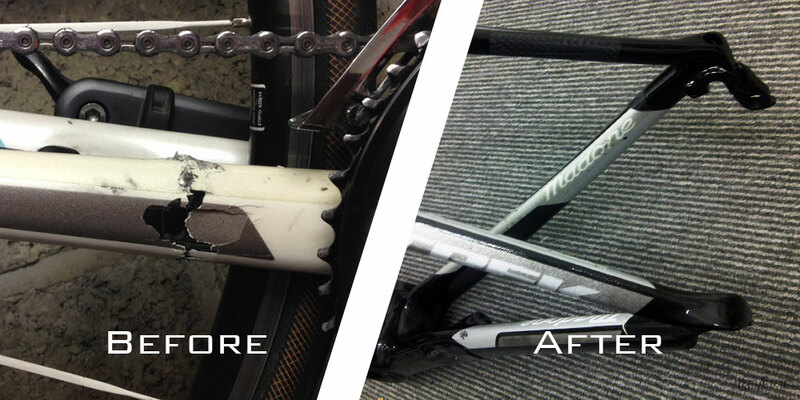 Because repairing carbon fibre bike can be quite an involved process and the nature and extent of damage can vary wildly, we can only provide quotes after seeing the damage and understanding from you what you require. For example, whether you need a factory finish or just a structurally safe repair with less emphasis on aesthetics will affect the cost of the job. Contact us today, we'd be happy to help.